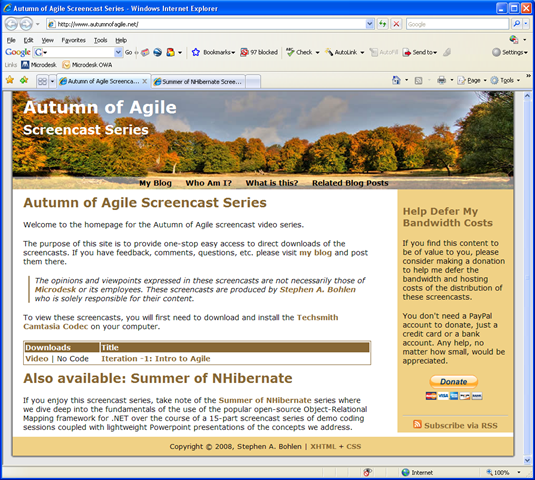 When I launched the Summer of NHibernate site back in July to host the screencasts for download, utility was the primary motivator for the design (if you can call it that) of the site. As you can see from the screenshot at left, its really nothing to write home about…unless you wanted to write home to warn your family that visiting this site might be dangerous to their sense of artistic appreciation. 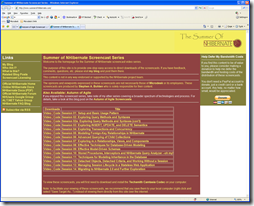 I basically mocked up a terrible two-sidebar-with-central-content-and-header layout, stuck the NHibernate logo in the header, and grabbed most of the color palette from the NHibernate JIRA issue-tracking site so that my site would at least have a non-arbitrary color scheme and would (kind of) fit in with the same aesthetic as the rest of the NHibernate ‘world’. One can debate the merit of that approach, but at least it gave me a starting point: copy what someone else has already done instead of wasting time doing something from scratch. A redesign was always on the to-do list…really! I always meant to take a little time and download one or more of the many freeware web site templates out there and apply them to the site, but there just aren’t too many ‘free minutes’ in my life and so it just never became a priority for me to focus on. I always have a to-do list, but it stops at 752 and ‘redesign the site to something more aesthetically appealing’ was always number 753. And since the site design as it stood certainly worked (in re: a place for the links and the RSS feed), I left it alone and didn’t worry much about it. After all, I reasoned, people weren’t visiting the site for the aesthetic, they were there for the content. 1995 called, they want their web site back! If you would like to submit a redesigned site, I’d be glad to consider adopting it. That’s a great idea; submit a patch. …which basically says "if you feel strongly enough to complain, then you should feel strongly enough to do something useful instead." To be clear, the commenter made the comment in good fun and I did indeed get a chuckle out of their point that the site looked rather like something circa 10 or more years ago. But I didn’t feel embarrassed enough to do something about it myself and the commenter didn’t feel strongly enough about it to submit me a proposed redesign so nothing came of it. Autumn Of Agile Needs a Site: what to do? So when it came time to launch the Autumn of Agile site, I had a quandary: it was important (I felt) for there to be some consistent aesthetic between the two sites so that they felt like they were part of the same ‘family’, but that meant that I had to either replicate the same terrible design of the first site or redesign two new sites. Now my ‘good enough’-sense was kicked into overdrive and since I felt redesigning one site was too much work, clearly redesigning two was twice too much work . So I just wussed-out and copied the design of the first site to the second, spent 10 minutes looking for a new JPG on the web, and swapped some colors around a bit. As you can tell from the opening section of this post, I knew the design stunk, but didn’t care enough to do anything about it. 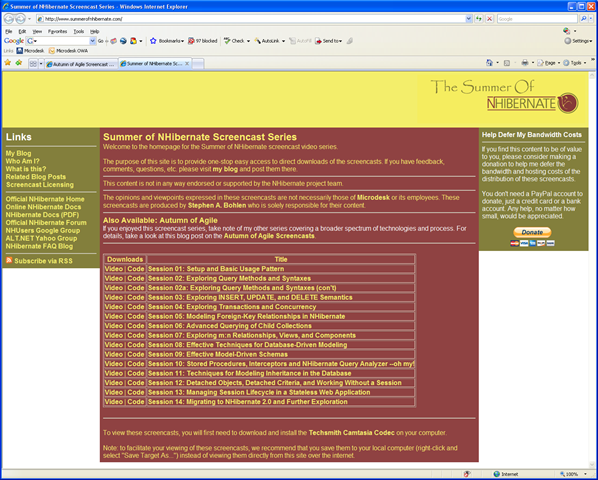 As regular readers of my blog are aware, one of my recent experiences in my having provided the Summer of NHibernate screencasts to the community has resulted in my coming face-to-face with some of the worst that the Internet has to offer. But both in the form of reader’s responses to that post as well as in the other positive feedback that I have received for my efforts, I am reminded that many people got positive value out of my efforts and that makes it worth the trouble. 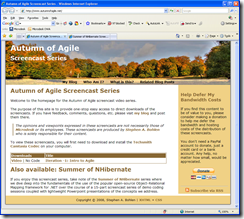 Without any warning, another wonderful thing happened to me this evening — an enterprising viewer of the Summer Of NHibernate and Autumn Of Agile screencast series has taken pity on me and submitted a complete reworking of the Autumn of Agile website. I’ve already put the content into the site so you can already see it there but as you can also see from the screenshot at left, this is a pretty much improved version of the same content. . It may not win any design awards for breaking new ground in web design (hey, where’s the flaming logo? ), but its 1000X better than what I had before and is the kind of thing I’m proud to use to deliver my content instead of something I have to be apologetic about like the former design. The amazing thing is, the contributor did this without any request from me at all — just all on his own out of what I’m sure is a sense of pity on me for having my content delivered from a site that looked like a 5th-grader built it in notepad . But without any compensation and without any discussion, he took it upon himself to build this for me so that I didn’t have to spend my own time doing it…or continuing to apologize for the state of the previous design . So without further fanfare, I’d like to take this moment to formally acknowledge and publicly thank Miroslav Popovic for his excellent and completely unsolicited contribution to the Autumn of Agile effort. If you have a spare minute, drop by his blog at http://codemind.blogspot.com and leave him a comment thanking him for his efforts. And BTW, yes, he’s just delivered a replacement for the Summer of NHibernate site so look for that to be much-improved in short order as well. I only saw an empty yellow box on the top. If you want we can put the logo back again?